​We work our whole life to acquire things. Yet, when our physical being perishes we go empty handed. I guess that is what drives many of us to believe in an afterlife. When we die, our legacy in this life becomes the yardstick we are measured by. Most of us hope our legacy includes being remembered as a giving person. My concept of a giving person is one who contributes more to society than they take. Undoubtedly, this is an imprecise definition, open to interpretation. “She was a giving person”, “He gave all of himself to the cause” or similar phrases are frequently used when people are being eulogized. To give something implies, we acquired or control whatever it is we are giving. Acquiring is pretty close to taking even if there is some type of exchange for it. Is “giving and taking” simply a zero-sum game? This month I was reading an article from The Economist, “Why the 20%, and Not the 1% are the Real Problem”. The story outlines how the wealthiest upper 20% of Americans are looking out for themselves and their families, not the rest of our citizens. The author claims the meritocracy that defines capitalism in the United States is creating two tiers, the haves and have nots. The word meritocracy implies “I worked hard to get it, I earned it and I deserve it.” I am not sure the writer intended this, but one key idea that comes through in the article is that the upper 20% are takers not givers. 1) What do we own that we can give? 2) What do we take that enables us to give? What do we own that we can give? While growing up I learned that our gifts are our time, talent and treasures. Let’s look at them one at a time and redefine what our gifts are. Time: Time is an interesting “gift”. Like all gifts it is finite. In Time’s case, it’s a “gift” we can only give as long as we live. But is Time itself really a gift? I argue, it is not. It is the dimension that enables the other gifts to become gifts, especially talents. I would replace Time as a gift with Presence, the act of being somewhere for someone or some group. Talent: the word Talent conjures up some special power we have that many others may not. In terms of gifting, talent is much less lofty. It’s simply the action we agree to undertake on behalf of our beneficiary. For example, the rocket scientist taking tickets for entry into the local fundraiser is using her Talent to take tickets, not her Talent to get us to Mars. Treasures: Treasures are possessions we control the disposition of. They include tangible assets that have a monetary value: money, stocks and other assets that can be converted (sold) for cash or used directly by the beneficiary. Treasures also include intangible things we can give. The intangibles are our talents, which have already been described above. Using this definition of treasures, I would use Possessions as our third gift to give. That was easy. Now, What do we take that enables us to give? Presence: We can only be present in one place at any given time. That makes our Presence very valuable. We are honoring the people, organizations, community etc. with whom we are present. What are we taking when we are present? We are taking from the people, organizations, and communities we are absent from. Our challenge in gifting as it relates to Presence is determining where our Presence can create the most impactful gift. Where do you think your presence has the most impact? Talent: Much of the “Take” in Talent comes from past investments made by our parents and those who help raise us. These investments take Presence and Possessions from these givers and make takers out of the receivers. This builds future giving capacity for the takers. It’s a swap from one generation to the next; Typically, the younger taking from the older. Why does the older generation accept this? If we lived forever, maybe we wouldn’t – if we want to survive as a species we must. A second example of Talent taking is when an individual uses their treasure to invest in a Talent, say a post-graduate degree. An alternative for the money paid for tuition could have been donating to the local foodbank. Have you ever looked at the money you paid to acquire a talent (through college courses, for example) as taking from the poor and hungry? Possessions: Possessions give us interesting choices. We can use our possessions to invest in our selves (taking, as in the tuition example above) or use them to invest in society (giving). Investing in oneself can create a greater capacity to give in the future. At what point do we stop reinvesting our possessions in ourselves (taking) to invest in our society (giving)? 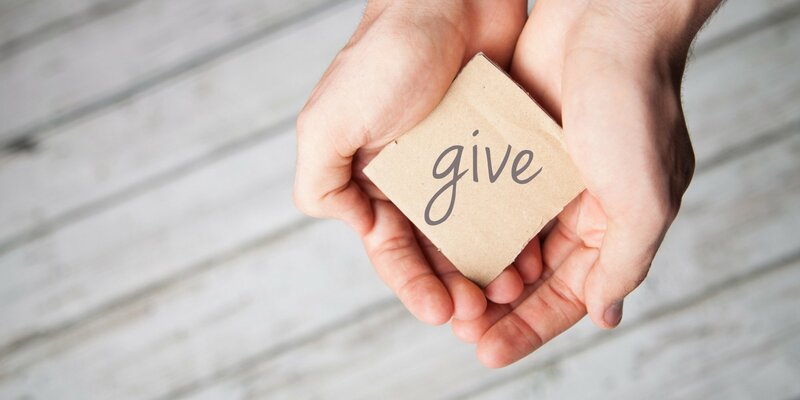 I need to call in some help from someone much smarter than me (with luck, one of you reading this article) to help establish the optimum equation for giving. My good friend, Albrecht Enders, of the endersgroup, teaches the art and science of innovation. He defines Innovation as change that increases the value of the product or service while decreasing the cost to deliver the product or service – he calls this the Value/Cost Ratio. Innovation is an activity that creates a step function increase in the Value/Cost Ratio. 1. Developing the formula for the Giving/Taking ratio. 2. Creating Innovations that grow the ratio by increasing giving and decreasing taking. The end game to 1 & 2 above is Utopia. How can we increase the value of giving and reduce the cost of taking in each of our three gifting areas? I am open to all suggestions because I think the answers can provide a roadmap of how to live. This leads me back to the title question, Why Give More than We Take? The three gifts we have before death leave our control when we die; We can no longer be Present, our Talent is gone, and we no longer have ownership of our Possessions. The question isn’t meant to conjure up despair or pessimism. The question is meant to get us thinking about how to maximize our net Gifts (increase the Giving/Taking ratio) while we are living in this life. How does this make me feel about The Economist article on the wealthiest 20%? I think The Economist should do a lot more work to help us understand if the upper 20%, including the upper 1%, are net givers or net takers before claiming “…the 20%, and Not the 1% are the Real Problem.” Frankly, they were lazy in their reporting. Their conclusion may be correct, but in the absence of any scholarship on how this group gives or takes, statements like “efforts to protect their status amount to opportunity hoarding” are eye catching and emotion stirring but could also be quite misleading. Here is my take. When I die my Presence and Talents will expire with me, while my Possessions will leave my control. Why wait? Give them generously now. Live with a high Giving/Taking ratio and don’t let it be a zero-sum game.